Your Havava maxi is a stunner! Goodness, you've been busy. :D looking great, Lovely. Laughed re comment getting bag boxes out...get hubby to work for you. These maternity dresses look amazing on you. And you glow! Wow ~ The havana maxi dress is sooo dreamy! 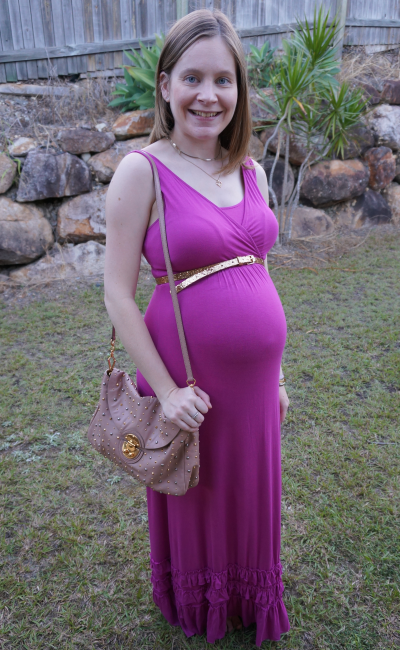 It is a gorgeous dress - one of my favourite maternity pieces for sure! You're baby bump is too cute! Its amazing to see mommy fashion!! You look gorgeous! Love that purple on you and it paired with the gold belt! So pretty! Love the long dress ! the pink dress is very lovely!! These dresses are fabulous on you! Your first Mother's Day sounds lovely - showers are lots of fun. Super cute maxi dresses! The colour magenta looks beautiful on your skin tone (I am "fair" or "pale" as you call it as well haha). Sounds like the baby shower was loads of fun! Oh dear - I am def having a little chuckle at you not being able to access your handbags! Your baby shower looked awesome Mica! They can be fun. Glad you got great things. You are so deserving. Love that gold belt with the purple dress. Fabulous dress and leggings outfit. You look AWESOME! Thanks! Needed to add the tights on Monday as it was so cold! Oh, I love both of these dresses on you...super pretty! I remember those days well! You look adorable, enjoy it all! Aww so glad you had fun at the baby shower! It sounds like had great people there, too! Ohhhh I LOVE your Miu Miu bag! Sounds like a great weekend. So glad you had a great shower! I definitely think that shade of pink is your colour. Sounds like you had a fabulous weekend. Reading all about it and the support from your family and friends makes me feel all warm and happy. I am happy that you had a beautiful baby shower. I bet you got lots of nice things. that gray print wrap dress looks so FABULOUS! you've got the pregnant chic look down! 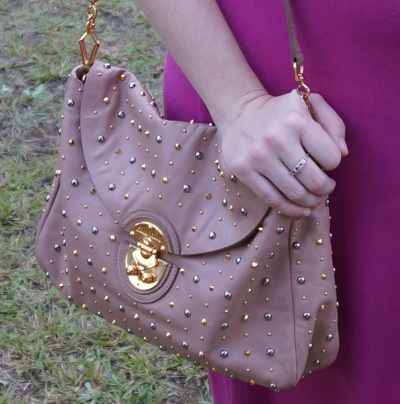 That studded Miu Miu bag is great! And as always I'm loving that leopard dress! :D Perfection every time you wear it. You are one of the chicest pregnant mamas I've seen. And that purple is a great color on you! 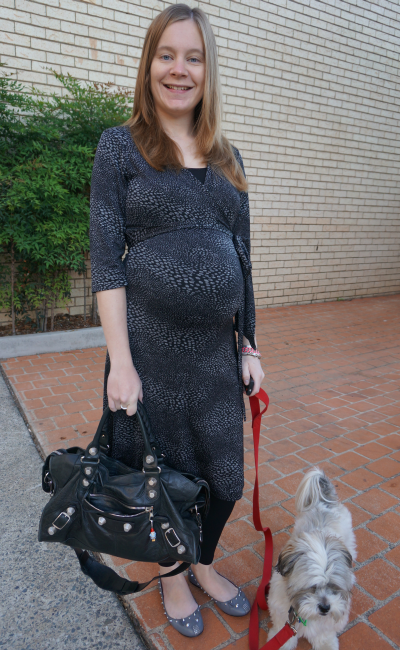 Check out you and your precious little baby bump!! Great purple color, dear! And your tummy is beautiful :) Nice to hear, you had a wonderful mother's day. Glad to hear you had a nice shower. Your comment about bending down made me laugh - I remember towards the end of my pregnancy and I had attended a formal event where I wore ankle strap heels. Yup my belly was way too big for me to reach the straps, my hubby had to buckle it for me. Haha that is love! I don't know if hubby would do that for me! Here, baby showers are a must - and they are so much fun, with activities and games. Sometimes they are gender mixed and done in hotels with music, entertainment... i went to one last year that had a stand up comedian ! Wow that sounds incredible! They are definitely not must-haves, or anything very big here. oh i thought baby showers are common ;) i haven't been here long enough to know tho but i'm glad you got one! and on mother's day too.. hehe. love the darker outfit here, so chic! and you just reminded me i have some bbags i haven't seen in a while too.. haha. LOVE the belt in the first outfit! Newest follower!